Today I uploaded Pugging with Shintar season 2 episode 10, which means that I'm halfway done with season two, hurrah! I've determined that I'll need/want it to run for exactly twenty episodes, since there are ten different operations for me to cover, and with my intended schedule alternating between operations and uprisings, that'll make for a total of twenty videos. With two uprisings per episode I will have completed all of them on story mode after the next episode, so for the remaining four installments meant to feature uprisings I'll switch to pugging randoms on veteran mode. Should be fun! Unfortunately as a whole, this season hasn't been as much fun for me as the previous one. I've mentioned before that recording the operations pugs has felt more like "work" than anything I've done before, and as I've progressed I've noticed that it's my self-imposed rule of wanting to do them "in order" more than anything else that's causing me issues. I've always said that the best way to have fun pugging is to be flexible and jump into whatever content people are willing to run at any given time. Unfortunately I need specific operations for this series, and I need them at specific times too, since I only really have time to record an ops pug during weekends. It's getting a bit frustrating to be honest! I've made a note for myself to not just fixate on the featured group finder operation in the future, but to also see what gives Conquest points in any given week, as those ops might be in higher demand as well. I'm hopeful that the next few will be easier to find groups for (as I said in the video, people aren't super fond of running that one operation that has more bosses than any of the others). Of course the biggest challenge will be Gods from the Machine, but at least I won't have to deal with that one until the very end. What also hasn't helped is that my viewers seem less interested in this second season than they have been in the first. It might seem silly to worry about viewer numbers when I'm far from wanting to make a career out of making videos and am used to low view counts to begin with, but it's still noticeable and a bit disappointing to see less engagement on these newer episodes than there was on the older ones when they came out. I don't know if the episode length is off-putting, or maybe people just aren't as interested in the content? 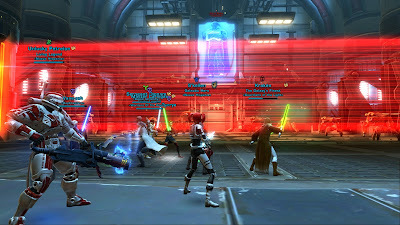 I'm guessing that season one was a bit more "relatable" in so far as most SWTOR players would have had an Esseles pug at some point (for example), so they have a frame of reference while watching someone else run it, but I'm guessing that not as many people have done operations or uprisings, and that might be why they aren't as interested. Anyway, I can only make guesses about that. If you're someone who's been following the series and has an opinion on this, feel free to share in the comments! S2E7: Tanking All The Adds in Uprisings - This one was a good demonstration of how the endless waves of adds that you get in many uprisings can get unpleasant for a healer (thus the title). S2E8: Cheerful Wiping in Terror From Beyond - With TFB being my second favourite operation, I was really happy to pug this one, even if there was a slight hiccup in the middle. I also ended up in another guild's partial guild run again, this one led by an unexpectedly friendly and not at all evil Decepticon. S2E9: Pleasant Uprising Surprises - This was probably the most fun uprising episode so far, with people interested in getting achievements in both of my runs. Even if I didn't need the achievements myself anymore and therefore gained nothing from them, it made for a nice break from the usual routine. S2E10: Enjoying the Sights in Scum & Villainy - Scum was a bit annoying to find a group for, but I already talked about that in the main post above. The group itself was once again very pleasant. Uprisings are just not my cup of tea. I don't like playing them, apart from getting all the achievments to 100 percent. And watching Uprisings on Youtube is no way better than playing them myself. I skip those episodes. It takes me awhile to watch the longer Operation-Videos. I just watched the first half of the latest Scum & Villainy-Run. Your narration is -as always- the best part of all your videos. And that is the problem...when i see you having fun, laughing, doing operations, i just want to log in and play the game myself. You're a too good of a content-creator, you drive your viewers away, bc they want to play the game instead of finishing the videos. What i'm really curious about, and what i really would like to see in the future, is a full run with your raiding team from Twin Suns Squadron. You made all this Outtakes-Videos...appetizer for more. Last words...if it feels like work...don't do it. I put "work" in quotation marks because as a content creator you're always striking a balance between doing things in the moment "just for fun" and aligning your play with your personal schedule for writing/video-making. The latter is also rewarding in its own way, but sometimes requires a bit of "work-like" behaviour to maintain. I'd feel worse if I didn't see things through though! I really enjoyed season one to the point that I would check regularly for the next episode and watch it as soon as possible. 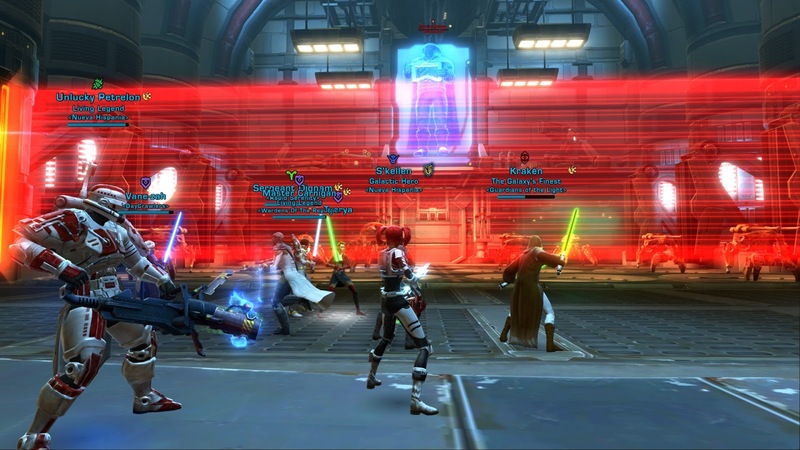 At the time I was still playing and pugging flashpoints was one of my favorite things to do in game. I've always thought that Pugs got a bad rep and was pleased to see someone show that the horror stories you see on the forum were the exception and not the rule. Also with season one I would read and sometimes post in the comments for the video, then check back a few times to see what others were saying. I'm not sure if these would count as views or not, maybe padding out the total views numbers? Now with season two I'm not currently playing Swtor so my interest is diminished though I do still keep an eye on the game through podcasts, youtube, reddit and this blog. Operations I did get into for a year and enjoyed them and then my guild 'wiped'. The operation episodes are more interesting and fun to watch but the length means that I need to find a time when I can watch. I can only speak for myself but with season two I still watch the episodes but they no longer jump to the top of my watch next list. I think your guesses for the reduced viewer numbers are pretty much spot on. The last thing to factor in is the continuing decline in game population. Just looking at fleet numbers on DM it's clear to me that server population is less now than TRE pre-merger. Thanks for your honest feedback, Forztr! That's probably the best and most to-the-point summary of the problem with uprisings that I've ever seen. I don't like to speculate about population but yeah, it has been feeling a bit quieter. With the continued slowness of new content releases I guess that's not much of a surprise. I haven't yet, but I do plan to watch a few, I promise! I only raided very briefly, my achievements tell me "11/08/2013"
(but my blog says January 2012) where I apparently completed Eternity Vault in master mode, which doesn't seem to exist anymore - and most of Karagga's Palace in story mode. I also remember Soa being horribly bugged. Did Nightmare difficulty even exist back then? Haha, don't feel like you have to! I know this type of let's play content is a dime a dozen and there aren't enough hours in the day for people to watch it all. I was mainly wondering why existing viewers liked some episodes more or less than others. Soa does indeed have a long history of being bugged and still has the occasional hiccup to this day. Still, overall EV and KP nightmare were much easier than anything they added in later, which is why they decided to remove them when they equalised all operations in 4.0 (or they would have been way too easy for their reward level). Btw, your achievements would have a later date for your EV completion because the game didn't have any achievements at launch - they weren't added until 2013. Yeah, I had a faint memory of Achievements being retrofitted.